It was a crisp cold morning in the upper 30s. It took me a bit to get motivated to get out of the warm sleeping bag, but I was hiking by 7:15am. I did some calculations last night and noticed that I will land at my next resupply spot either tomorrow night or the next morning. Again, this is much sooner than I anticipated as I didn’t expect to be able to do this higher mileage so early on. I’ll be getting to Fontana Dam Lodge, and looking ahead my next stop is a rustic hostel I may quickly go in and out. I want to spend the night in the lodge tomorrow night rather than get there the next morning and spend the day loitering like “hiker trash” getting my errands done. I’d just like to spend the night and get out around noon the next day. In order for this to happen, I need to do 49mi over the next two days. I did what I could to keep a good pace today, but there were many good distractions. The weather was fairly perfect with a crisp morning and then warm afternoon. Spring has definitely arrived and the birds are active in the mornings. I want to try to capture some of the sounds, so I recorded what I heard this morning and you can listen to it by clicking here. This is my first time trying this, so I hope it works. It was also the first day with much grass along the trail. The skies were clear, but it was hazy. I was glad it was clear because today was packed with views as the trail stayed fairly high on a ridge and hit many viewpoints. 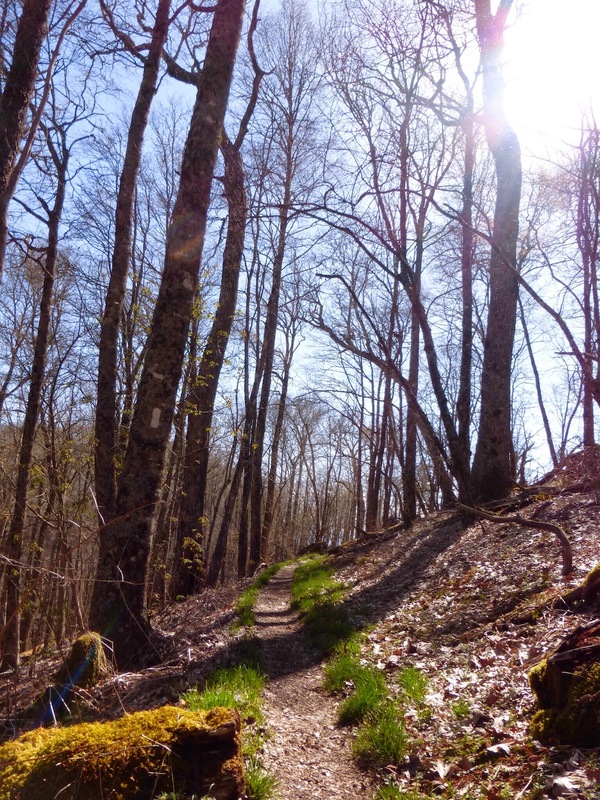 Even while the trail wound in the woods, the views could be seen through the bare trees. 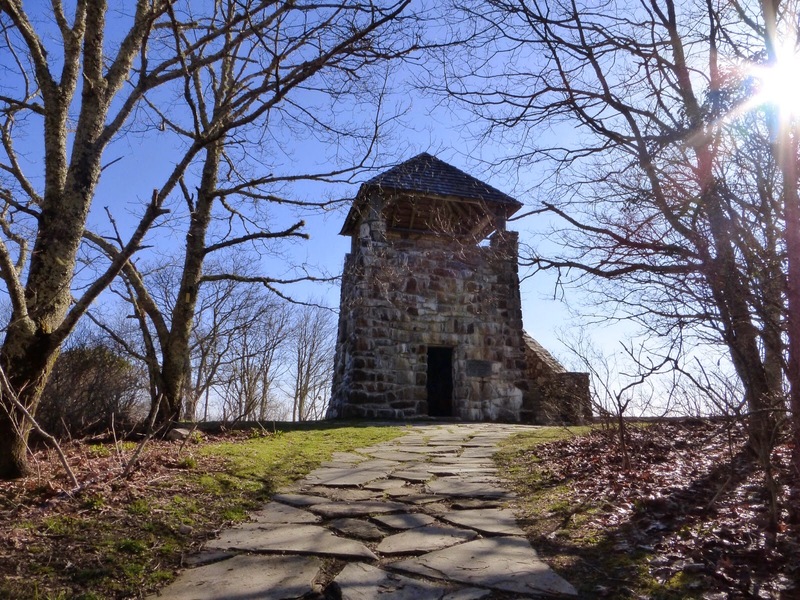 The first view was on Wayah Bald where there was a stone tower. 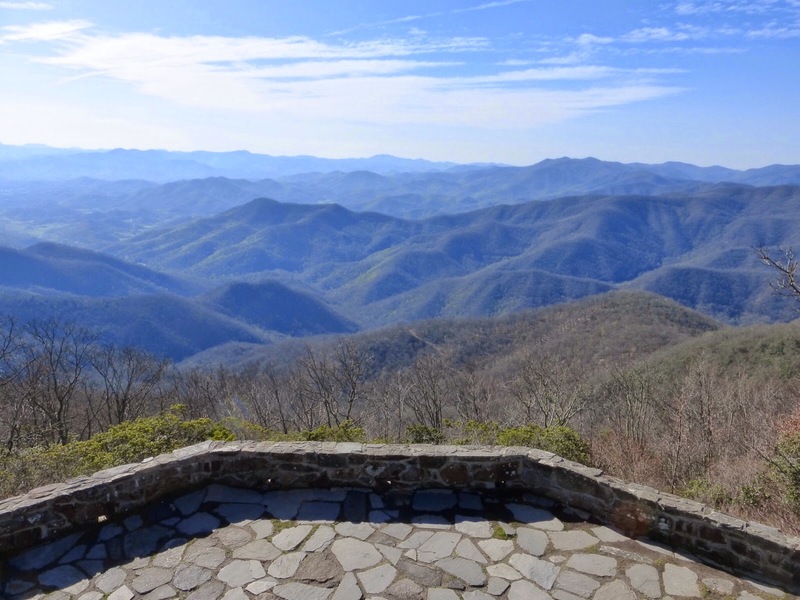 I listened to more of The Fault In Our Stars as the trail dipped down for awhile and then back up to Wesser Bald where there was an observation tower and I happily ate my lunch. Here is the view from the tower. Then the trail went down steeply almost 2,900′ in less than 7mi to a touristy place called the Natahala Outdoor Center. As the trail got lower, there were more leaves on the trees and it’s cool to see the transition. The green tunnel is not far away! It felt like I was entering a pretty amusement park and was little jarring. I feel like I just got back on trail and I know I’m already hitting a lodge tomorrow night, so this was a bit much for me. It was very nice though. There was a convenient store, outdoor store, restaurant, cabins to rent, and opportunities to zipline, kayak, and river raft. The trail goes over a bridge that connects all of this. I got ice cream and ate it as I walked through. I hiked up the steep hill to camp and headed for a spring where I’d get final water for the day and hike a bit further to camp. 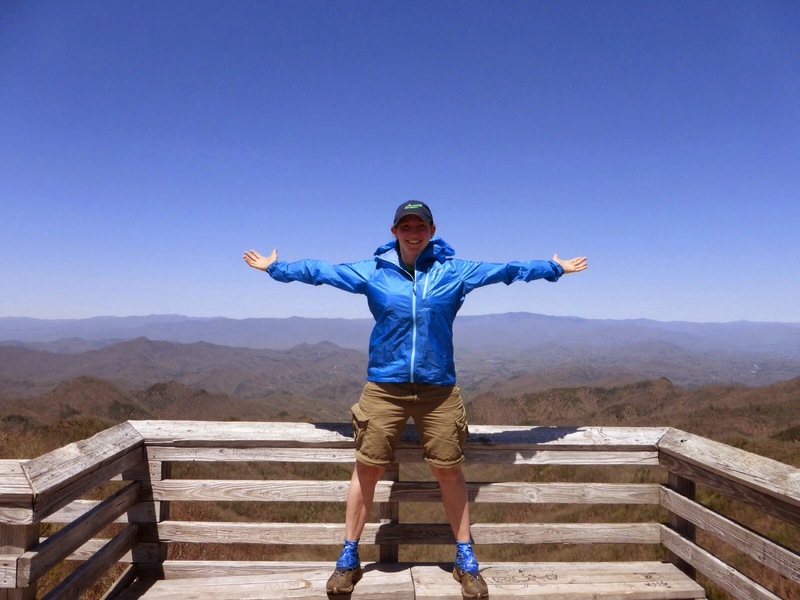 When I got there, two other thru hikers were camped there and said I could join them. I told them I was going to go a bit further to keep a schedule for the next day. They said that if I was aiming for 25mi to Fonatana Dam tomorrow, I could hike with them because they were too. 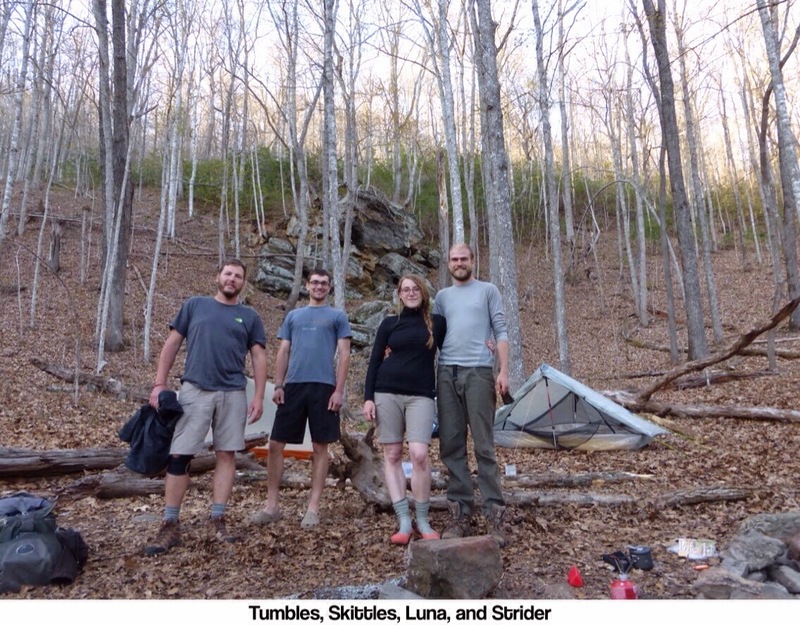 These are the first hikers (since Harly on Day 1) I met planning to do over 20mi. I was still tempted to hike on to get more of the steep climb out of the way, but I told myself I’d do what I could to embrace the people side of this trail. They are very nice and sold me when they said they aren’t loud and wanted to go to bed early to get an early start tomorrow. Their names are Skittles and Tumbles and they have been out one day longer than me, so they’ve also been keeping a good pace. Another couple joined us shortly after that I had talked to my first night. They are doing pieces of the trail and hitched up to do this part. Here is everyone and our site which isn’t the flattest, but quite picturesque. This is the first night I’ve camped where I get enough service to watch a show, so I’m excited to now watch the rest of The Mindy Project before bed!